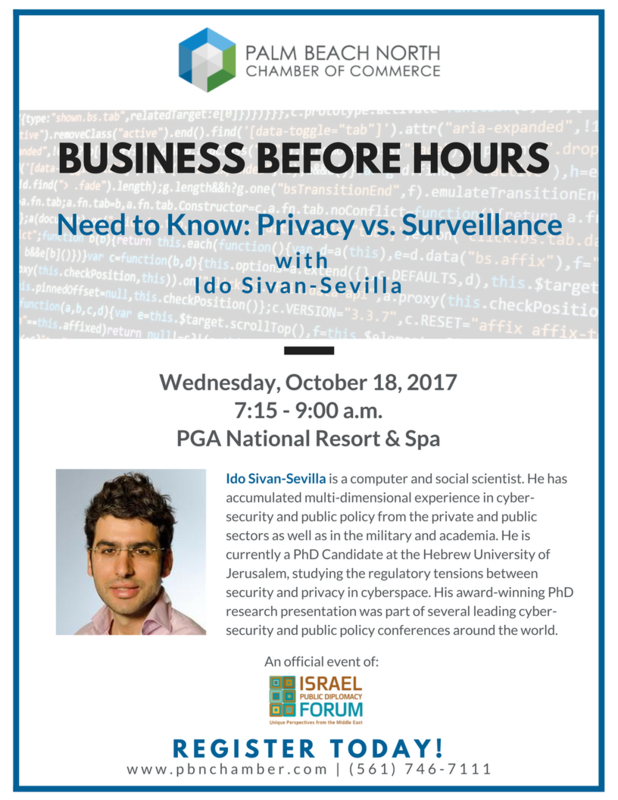 Wednesday, October 18 at PGA National Resort & Spa featuring keynote speaker, Ido Sivan-Sevilla. We are honored that the Israel Public Diplomacy Forum specifically selected the Palm Beach North Chamber of Commerce to host this event. Ido Sivan-Sevilla is a computer and social scientist. He has accumulated multi-dimensional experience in cyber-security and public policy from the private and public sectors as well as in the military and academia. He is currently a PhD Candidate at the Hebrew University of Jerusalem, studying the regulatory tensions between security and privacy in cyberspace. His award-winning PhD research presentation was part of several leading cyber-security and public policy conferences around the world. He is also serving as a research fellow at the cyber-security program of the Institute for National Security Studies (INSS) and writing a book about cyber-security regulation at the civic and business sectors with Dr. Gabi Siboni.